The Light International Premier filled the auditorium and the energy and excitement were large. Our Austin delegation took up most of the entire 8throw, so we had a great vantage point for the performance. There were welcome addresses by Albert Ben-Shloosh, the Director of the Acco Festival; Raya Strauss, one of the leaders in the region and Steve Adler, a Ballet Austin Board member and a leader in Austin responsible for the arrival of the Light project at Acco. Steve shared some background information on Light / The Holocaust & Humanity Project and the importance of communities engaging in dialogue around hate, prejudice and bigotry. He also described the importance of both what is seen in the ballet, and what is not seen in the ballet. Artistic director Stephen Mills wrote a story based on the experience of Holocaust survivor and Houston, Texas resident Naomi Warren. Albert presented Steve with the Guest of Honor Acco Festival trophy, given to one act at each Festival that represents a center point of the festival. It was quite an honor for the Light project. Steve gave the trophy to Cookie Ruiz, and here’s a photo of her with it. The lights dimmed and the performance began. Flawlessly done, the dancers danced the 5 acts of the ballet. As expected, it was powerful and moving. Words don’t describe the feeling this ballet gives the audience. The big question prior to the performance was how it would be received by an Israeli audience. The answer: they loved it. In a country that deals with the issues of the Holocaust regularly, the combination of precisely executed dance elements by accomplished and professional dancers like those in the Austin Ballet and the subject material built into the story of the Light project was extremely well received by the Israeli audience. Even our tour guide, Dani, commented on how wonderful the performance was and how deep and thought provoking it was for him. But the confirming sign of success was the clapping at the end of the show. It started out as any audience, with wild applause, but very quickly the clapping morphed into a rhythmic, synchronized clapping that went on for several minutes. Our Austin delegation was somewhat surprised, not knowing what the synchronized clapping meant, but we were then told that it was a high form of praise and acceptance in Israel, and common after a successful performance. 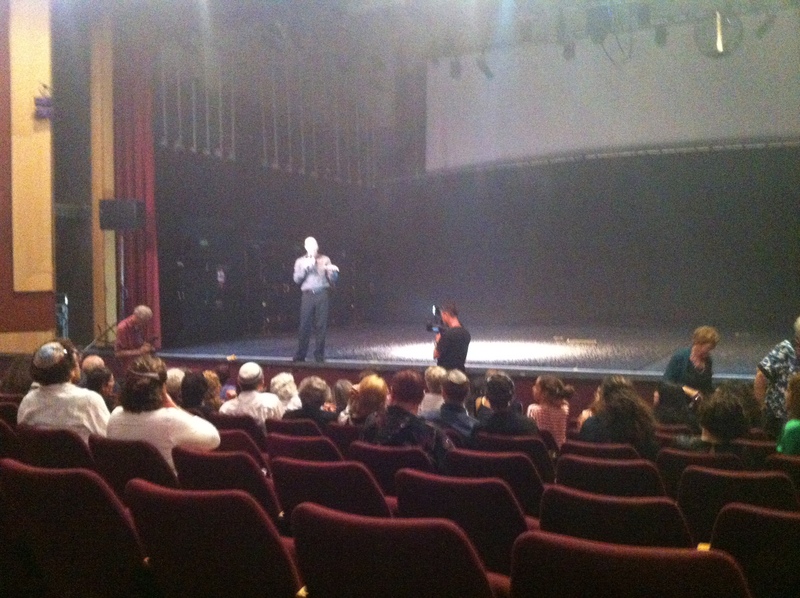 After the show, Stephen Mills came onstage to answer questions from the audience. He was asked about the symbolism of some of the elements in the ballet, and he described what his vision was. He was asked about the story and he shared some of his experience with Naomi Warren. He also was asked about the ending, and he let the audience know that Naomi’s wishes were for a positive, survivor ending, since she was a survivor. All in all, a fantastic (shabab) evening none of us are likely to forget. – Keri Pearlson, a member of the Jewish Community Association of Austin (JCAA) Board of Directors. This entry was posted in Ballet Austin in Israel and tagged Acco Festival, Ballet Austin, Israel, Jewish Community Association of Austin, Light/The Holocaust & Humanity Project on September 23, 2013 by Keri Pearlson. We had heard about the wonders of an Israeli breakfast. It comes with the price of the room. We went downstairs as usual to choose from yogurt, eggs, vegetables, hummus, herring and a stunning assortment of bread looking things – pound cake, pita, rolls, etc. We learned quickly that the shy go hungry in thi s “buffet free for all.” As the dancers wandered in – slowly and a bit red eyed – they shared the stories of their evenings out. It was a slow morning, so we took a walk through the old city. The signage is in Arabic or Hebrew depending on the part of town. There are booths of everything you can imagine including some inredibly fresh fish from the Mediterranean a few feet away. Most people know my mind goes blank when I am presented with too many options so I was unable to focus at all of the spices in burlap bags, clothing and toys that light up. We walked the ancient tiny streets which were like the smallest Venice alleyways except, there are cars everywhere. Acco has traffic circles instead of stop signs and lights. Pedestrians have the right of way but it takes a while to get comfortable with the near death experiences. Right of way does not mean that they won’t drive an inch away from you. 1:00pm the dancers had their first chance to go inside the theater. Bill Sheffield, the Ballet Austin crew and the local tech folks were working magic with the small space. I loved watching the spacing rehearsal. Listening to the strategies to make Light work in a new space is fascinating. It included Stephen’s vision with the collaboration of the company.We had coupons to eat dinner in the Acco entertainers garden. We all walked over to the opening ceremonies where we were greeted by three rows of VIP seats marked with Ballet Austin signs. It is so odd. The only English in Acco are the words Ballet Austin. Albert has thought of every detail to make our stay amazing. We stayed for the concert as long as we could. Then we escaped early to go get some sleep. 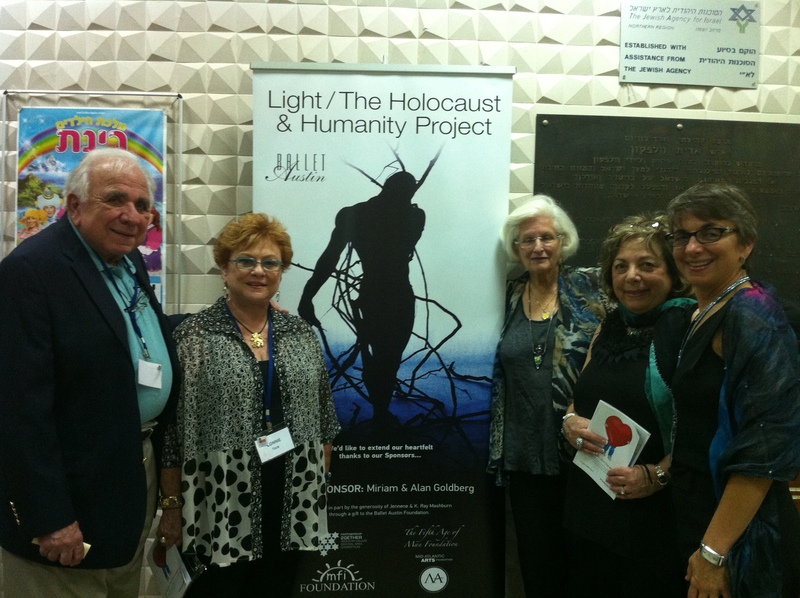 This entry was posted in Ballet Austin in Israel and tagged Acco Festival, Ballet Austin, Israel, Light/The Holocaust & Humanity Project on September 23, 2013 by Barbara Shack. Today the company traveled to the home of Kibbutz Contemporary Dance Company (KCDC). They live and work on a kibbutz (a rural communal settlement) in the region. Just like us, the company rehearses in their black box theater. Rami Be’er, Artistic Director and Raya Strauss, their benefactor greeted us. Stephen spoke and then KCDC performed. The work was incredible! And what an astounding group of dancers. My favorite response from our dancers was “Can we learn to do that?” I can’t describe the beauty of their fluidity and control. Next Ballet Austin danced. Yes, with jet lag and no real warm up, our dancers were still gorgeous. They performed an excerpt from Light. Honestly, I panicked a little when I thought about BA doing our version of a hora in Israel. But it worked! One of their dancers complimented the quality of our dancer’s movement (high praise from a dancer who had just blown my mind performing). Another added that he couldn’t believe that we could move with jet lag. As we all know our dancers can do anything (yes, I’m biased – and this trip has done nothing to change my mind). Most of the KCDC dancers came through their second company just like ours who came through Ballet Austin II. Yoni, thier touring director showed us the studios and explained the kibbutz concept… “It’s based on communist and socialist philosophy… not like the United States.” While it is gorgeous there – and I am getting more and more in touch with nature, I’m not so sure agriculture would be a good fit for me. The dancers had the afternoon off. Eugene and I had meetings with Isi and with Claudio – the videographer. I admit Eugene and I had reached the point of delirious exhaustion so we had a quiet dinner. We deemed it a great success. The food was wonderful and we stayed awake all the way through the meal. This entry was posted in Ballet Austin in Israel and tagged Ballet Austin, Israel, Kibbutz Contemporary Dance Company, Light/The Holocaust & Humanity Project on September 20, 2013 by Barbara Shack. Sept 18th at 11am and we’re leaving Austin, TX – all 32 of us which includes dancers, crew and staff. After a 3 hour flight we land at Newark airport outside New York. Our international flight was departing from a different terminal so we found the subtly marked hallway that led to an unimpressive stairway that led to the shuttle bus to terminal C – our home for the next 7 hours. We ate lunch and walked around. We ate dinner and walked around. It is a very big terminal and we saw it all. It seemed wherever we walked there were Ballet Austin dancers wandering the halls in a different pattern from ours. Eventually we joined the BA colony surrounding the battery and computer charging station near our gate. Next we went through a second security checkpoint – special for passengers flying to Tel-Aviv. At 11pm we departed Newark for the 10+ hour flight to Tel-Aviv. If there was any trepidation about the distance and time that separated us from our destination it was apparently relieved as evident by the sight of so many of the dancers interfacing with the touch screen of movies, television shows and music available at every seat. United has lots of TV and movie options on the screens in the back of the seats. Of course when presented with too many choices I was a bit paralyzed. Finally, I chose a few episodes of “Elementary”. We were served dinner and then breakfast. It has been forever since I had airplane food. It wasn’t bad – or maybe I was excited by the retro aspect of the compartmentalized food. Most of us slept. It was very quiet – and dark. When we landed I was prepared for drama with customs… Let’s say over prepared. Our group seemed to be the only foreigners on the plane so there was no line. Once the front folks (thank you Cookie, Orlando and Ashley) explained why we were coming to Israel the rest of us got questions like “What airline did you fly on?” No one wanted to look at our luggage. We were greeted by Lital (the logistical genius who made this trip possible) and Isi (Albert’s producer) with a sign with the Ballet Austin logo, a splendid way to arrive anywhere. We met Samir, our bus driver, and traveled one hour plus to the walled, medieval city of Akko. Our hotel has a crusader era aqueduct running through the lobby leading to a cistern in the courtyard. We are in Old Akko with a recorded history reaching back 4,000 years. It is a remarkably mixed city with signage in Hebrew , Arabic and a few in English for the tourists. After check in and a bit of breathing time Samir drove us to Morganfeld’s restaurant to eat with the members of the western Galilee partnership. Albert Ben-Shloosh greeted us at the entrance. It is unbelievable that Albert’s dream of bringing Light / The Holocaust & Humanity Project to Akko is a reality and we are here. The food was delicious! I now know I have never really had hummus. But the most beautiful moment of the evening… was when they brought out a brazier of meat and Albert called over to Bill Sheffield to say that the steak was for him. We knew we were very well taken care of. This entry was posted in Ballet Austin in Israel and tagged Akko Festival, Ballet Austin, Israel, light / the holocaust & humanity project on September 19, 2013 by Barbara Shack.